Howl’s Moving Castle by Dianna Wynne Jones is not a new book by any stretch of the imagination, but I was looking for something to read the other day and remembered that this was still sitting on my “to be read” shelf. Having read a few of this amazing author’s books before, and having watched the stunning animated movie by Hayao Miyazaki, I knew I was in for a wonderfully fantastical read. Synopsis: Sophie is the oldest of three sisters, and according to the unwritten rules of fate she is destined for little more than working in her parent’s hat shop for the rest of her life, or so she thinks. As her sisters have gone off to do amazing things, she is left behind, toiling away and talking to the hats she dresses. But when she is suddenly confronted by the Witch of the Waste, who seems to consider her some kind of rival, she is forced to leave home in the guise of an old woman. Unsure of how she is going to get her old body back, Sophie seeks out the only person she can think of to help change her back. 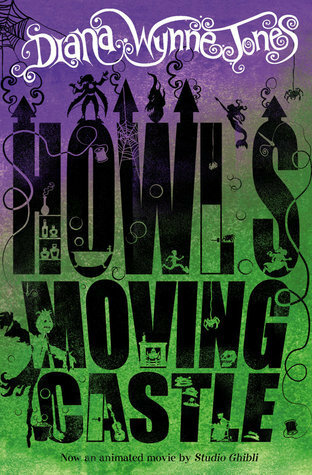 As I mentioned earlier, I’ve read a few of Diana Wynne Jones’ books before, so I have a bit more background information on the world Sophie lives in, and Howl’s castle makes so much more sense with this information in mind. Howl is an amusing character, and he definitely comes across as less of a jerk than he is in the movie. It has been years since I last watched Miyazaki’s version, so I was able to reimagine all the characters, and I truly enjoyed them far more this way. Sophie has more of a backbone in the books; Calcifer is less of a cute little flame and is a true fire demon; the scarecrow is as creepy as Sophie seems to believe he is; and there are far more stories going on than just Sophie’s own. Although there are more books in this series, I don’t think that I will be reading them. This book felt strong enough on its own that I’m not compelled to find out what happens afterwards. It’s a fun story, with a tonne of great characters, some really weird moments, and I enjoyed it thoroughly.